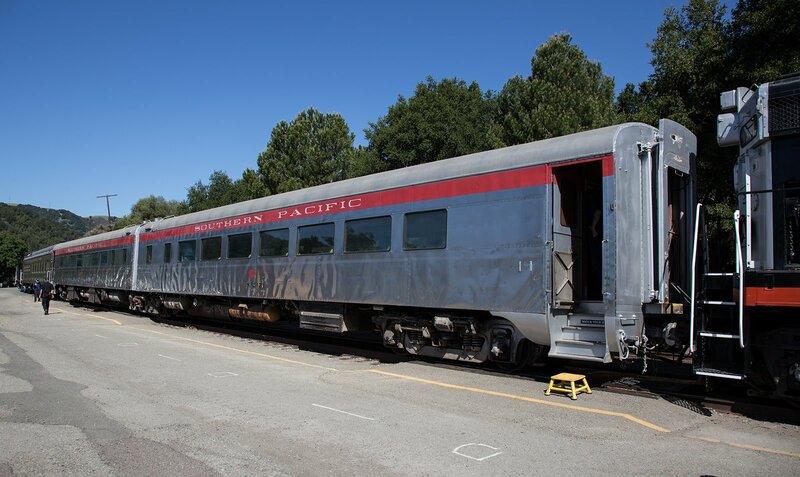 This car was part of a series of cars built new for the Southern Pacific Railroad for Daylight service between San Francisco and Los Angeles It was originally built with fluted sides but like many SP cars was rebuilt with flat stainless steel sides. This car was rebuilt on 7/19/63. The car was still in service in 1970 and was not sold to Amtrak in 1971. but held by Southern Pacific. This car was then sold to the Algoma Central Railway of Canada in 1974 and renumbered 458-459. Bytown Railway Society purchased the car in 1988 and sold it to Golden Gate Railroad Museum in 1996. And, PLA purchased it from the GGRM in March 2008. Initial restoration work by the PLA at Brightside allowed the car to return to operational status on the Niles Canyon Railroad in November, 2008. Since 2008 major restoration work on the car has continued. All of the seats have been reupholstered and the interior has had the many layers of paint removed. In 2011, the car was removed from active service and major repair of the roof was accomplished. This included adding new material at the roof line, fabricating new material around the A/C access covers and application of a 20 year roof coating. The exterior stainless steel was cleaned and the proper red stripe and lettering applied. The vestibules and car ends were painted in simulated stainless steel. In 2012 interior restoration continued with focus on the men’s and women’s restrooms and painting of the interior of one of the cars. The car returned to service for the 2012 Train of Lights.